You may have seen, heard, bought, or thinking of buying of the new, stylish, Xperia Z1 water-resistant phone with the slogan of "All the power and smartness of Sony in a premium smartphone". Don't invest your money on this mobile. The same quality and performance as our compact digital cameras. The same screen technology as our high-end BRAVIA® TVs. Crafted into an elegant and waterproof* smartphone. 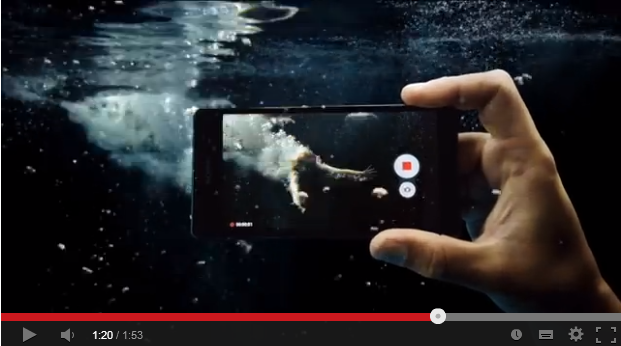 With Xperia Z1, you truly get to discover the best of Sony for the best of you. *Covers must be shut. Only in fresh water up to 1.5 m for 30 minutes. Covers must be shut, if you're charging your phone and a cut of water falls accidentally, your phone will get damaged. In addition, pools do not have fresh water, it's full of Chlore (to kill the bacteria). *Provided that all ports and covers are firmly closed, the phone or tablet is (i) protected against low pressure jets of water from all practicable directions in compliance with IP55; and/or (ii) can be kept under 1 m of freshwater for up to 30 minutes in compliance with IP57; and/or (iii) can be kept under 1.5 m of freshwater for up to 30 minutes in compliance with IP58. If we look further, more hypocrisy. The use of a small font is necessary to make less users read the condition. They're saying: you shouldn't put your mobile phone underwater unless it has met some conditions you have never heard of (IP55 and IP58 conditions). You need to be an experienced engineer to determine the correct, but weak conditions to put your phone underwater. *The phone or tablet is not designed to float or work when submerged underwater outside its classification range and should not be exposed to any liquid chemicals. If liquid detection is triggered on the handset or battery, your warranty will be void. Do not make this phone float unless you have determined the classification rage. Meanwhile the sick twisted video advertisement, but why promote in such dishonest way? The answer is simple: there is too much competition and Sony is desperate. You shouldn't put your phone under water, but in the advertisement, they encourage you to do so. PS: The touch doesn't work underwater, press the button thrice or more to work. Personal experience: Touch didn't work underwater at all! I've tested it and it froze after 10 minutes. When I got out of the pool, the phone turned off and I saw water inside the lens. I was just minutes. All my data, pictures, videos, messages, passwords, applications got permanently lost with the phone damage. Not only Sony wouldn't pay for the repair, they couldn't repair it neither recover my information. So as testing the phone personally, my Xperia was not resistant! The weak cover of Z1 is almost water-resistant but the phone isn't, actually there isn't any true water resistant phone, it's all a cheating marketing policy. You can barely take pictures underwater (pressing the button 10 times to shoot one blurry picture), you shouldn't put more than 30 minutes or more than 1.5 meters (although mined got water penetrated after 10 minutes) and I got no warranty what-so-ever. So, a phone you can't use in water is not practically water-resistant. After digging, according to the Xperia Blog, the glue that keeps the back panel together can potentially separate under extreme heat. The device can easily reach such high temperatures through prolonged use, as it takes a huge toll on the processor. When this happens, the heat may melt the glue and cause the back panel to slightly separate from the rest of the device’s casing, creating the ideal entryway for water to seep into places it shouldn’t. Here is the evidence (a clip of a private video) that shows the phone suddenly becoming water damaged, even though the phone was fine under water. I tried to switch the phone off to prevent damage, but whenever I tried, it would turn back on, regardless of how i turned it off (3rd party app or power button). On it's shame. I'm going to move to an iPhone 5. Better battery performance, faster mobile, and honest company.